Despite indications that Podolski is not happy and might look for a move away from the Emirates, Arsenal boss has confirmed that the German forward is not for sale. Lukas Podolski has made just one start for Arsenal this season after winning the World Cup with Germany in Brazil. 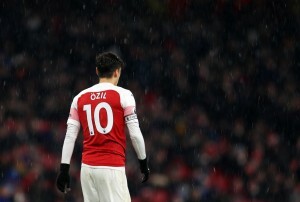 Recently, the German forward expressed his concern at the lack of playtime he was getting under Arsene Wenger and suggested that he might consider his future at the club in the coming January transfer window. However, club boss Arsene Wenger said that the 29-year old will have to fight for his place in the front three and denied claims that a cut-price deal was on the table, with Napoli said to be one of several interested clubs. Speaking during an hour-long television interview with beIN Sports, Wenger said: ai?? ?It is not established at all that he will leave at Christmas. It is me who sets the price and (the reported deal) doesnai??i? ?t correspond at all to his price. He is not for sale and there is no offer. ai?? ?Podolski plays a position where there is a big competition. He came very late from his holidays [after the World Cup in the summer], so he started after his team-mates and was not good physically.ai??? With new-signing Alexis Sanchez living up to his price tag and lighting up the Emirates with his performances and the return of Theo Walcott from a long-term injury have further jeopardised, Podolskiai??i? ?s chances of featuring in the first team. On the other hand, severely injury ridden Abou Diabyai??i? ?s future may still be at the Emirates as Arsene Wenger expressed his desire to let Diaby be a part of Arsenalai??i? ?s plan. Since making an appearance in Arsenalai??i? ?s 2-1 Capital One Cup defeat to Southampton in September, the midfielder has failed to play again, and is currently sidelined with a hamstring tear. The 28-year old has made just a single Premier League appearance in the last two campaigns, and is out of contract in June. However, Wenger has revealed that he intends to give the Frenchman a new contract if he can come back from his latest injury in time. “He’s a player for who I have a huge amount of respect,” Wenger said . “Imagine that each time he comes back there’s another injury. You have to start all over again. “He works six to eight hours every day to get back into shape, and each time he comes back, he gets injured again. He’s a player who was destroyed by competition, by a bad tackle, which has never been highlighted.